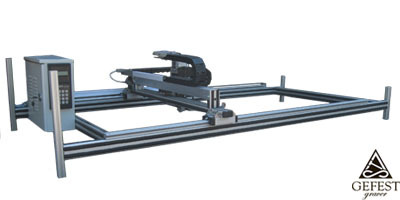 Engraving machine "Gefest-Graver"EMF 600х1300 Price: 4050 ***. *** - Euro (payment at the market rate). The mechanical part of the machine is made by"ISEL"– Germany. It’s reliable and no maintenance require. Electronics and software - brought to the precise workfor many years. Sizes - 1685 x 790 x 450 (mm x mm x mm). Weight – not more than 40 kg.Power supply 220 V / 50 Hz ~ 127 V / 60 Hz.Power consumption - not more than 80 W.
Working materials - granite, gabbro, basalt, glass, metal, plastic.Positioning accuracy of 0.05 mm, the complete absence of backlash.The maximum slope of the workpieceis 45 degrees.The number of semitones in the image is 256.Image depth is0.1 ..1.0 mm (up to 2.0 mmon the marble)..Productivity (300x400mm 1.5-2 hours, depending on operating mode). Tool life is not less than 30 images of 300x 400 (mm).